The embedded from is showing up on a PC and not on a Mac. Also I have linked a few forms together through a submit button...that is not working. I am trying to link all these forms to one another...meaning when you are done with one, you click and go to the next and then after all the forms, you check out with paypal. Are you using any WordPress plugin or the forms are embedded using normal embed method? It seems that the issue is with https URL of your webpage that cannot load http content without manual intervention . Please check the webpage with http URL so that the forms are displayed correctly. 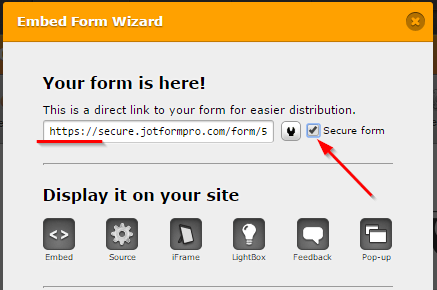 If you want to use https on your webpage, please try enabling secure form for the form in Form Embed wizard. Please be noted that free accounts are limited to receive only 10 SSL submissions/payments in a month. You may be required to upgrade your account in order to receive more SSL submissions/payments. The other query with redirecting to another form is moved to a separate thread and shall be addressed there shortly.